The abdominal stitch that they pioneered is a miracle, one stitch that’s literally changed our lives. 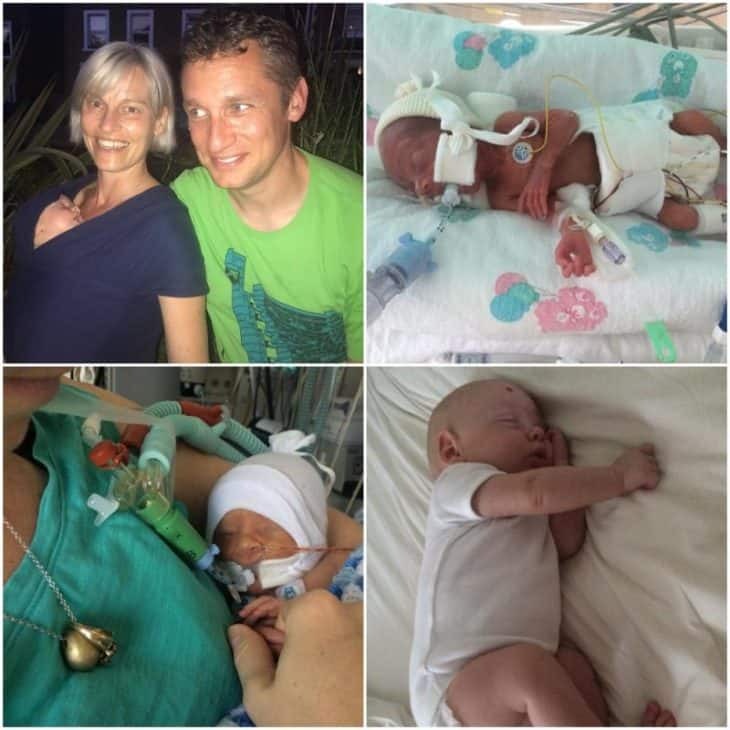 Katharine & Tom tragically lost their daughter Matilda when she was born at just 24 weeks. But they went on to have Raphael thanks to the care of the Tommy’s research centre at St Thomas’ hospital. Katherine Bletcher, 38, and Tom Kendall, 40, lost their daughter Matilda just ten days after she was born at 24 weeks. The couple, from London, now have a three month old son Raphael, born thanks to surgery pioneered by the Tommy’s team at St Thomas’ hospital in London. Tom and I had been together just under a year when I was diagnosed with cervical cancer in March 2013. Our first concern was, ‘Would we be able to have a baby?’ Luckily they were able to perform ‘fertility saving surgery’, removing my cervix, rather than a full hysterectomy. A year after surgery we started trying, it didn’t happen which was disappointing but I was quite philosophical. In January 2016 we started IVF and the following month we found it had been successful first time. We were over the moon and the first 24 weeks of pregnancy were probably the happiest of my life. We felt very connected to this little human inside of me and, although we knew there could be issues, we weren’t particularly worried. I’m so glad I enjoyed my pregnancy because it was my only time with my daughter and it was really happy. My waters broke at 23.3 weeks, completely unexpectedly, and it was horrific. I remember saying, ‘It’s too soon.’ I felt it was all over but, at hospital, they gave us hope, women could go weeks with broken waters. I spent four days in ante-natal then felt really ill. It sounds ridiculous, but because I’d been told I couldn’t have a natural birth due to my cancer surgery, I didn’t realise I was in labour. That evening my infection markers increased so they moved me to the delivery suite just in case. I remember that final contraction just as they were preparing me for a C-section. They were just about to start when the consultant said baby’s head was out, confused, I pushed and our daughter was born. I felt happy, amazed she was alive and wriggling when we’d been warned she may not be breathing. Tom went with her to neonatal and I’ll never forget the look on his face, so proud. He was a Dad and I felt glad he was there to look after her. That first night I was in high dependency, massively infected, on antibiotics, but we were in that blissed out state of new parents, and then, the next morning, Tom took me up in a wheelchair to meet her. She was tiny, just 612 grammes, barely as big as my hand, but she was perfect and I had all those new mum feelings, love, wonder and pride. We suffered so much trauma between my waters breaking and the day she died, wave upon wave of terror and horror, trying to do the best for this tiny girl who needed us to stay calm, to love her. At first she did well, coming off the ventilator after four days and fighting off infection, but then she got sepsis and everything began to fail. On Saturday her blood pressure dropped and they feared the worse. It came back up again when we got her out for, what we thought, would be our first and last cuddle. They switched off the machine and we held her and read her a story, Guess How Much I Love You. She continued to fight for another 40 minutes so I whispered, ‘You can let go little one. Go and be at peace now.’ We both held her close as she died. She was a miraculous little girl. We know now that if she hadn’t fought her way out naturally against all the odds, I’d never have carried another child. It really is thanks to our daughter that we now have our son. It was a brave thing she did, she was a very powerful little girl, our Matilda. I’d only ever lost grandparents before and I realised that there’s an invisible line you cross when you lose someone who isn’t supposed to go, you don’t get to cross back again. The world changes and you see everything differently. Life became about getting through the next moment for us both and I don’t know how we did it. I remember being on the verge of collapse leaving hospital without our daughter. Even now, every day, I can’t believe she’s not coming back. She was here, then she wasn’t. It doesn’t get better but we’ve learned to live with it. She’s very much a part of our family and we talk about her a lot. As a couple we kept talking, kept sharing, nobody could really understand except us and we were determined to go through it together. We wanted to know why things went so wrong and soon learned about the trans abdominal stitch, a higher stitch than the vaginal one I’d had, which has been pioneered by Professor Shennan and the Tommy’s team at St Thomas’. I had the stitch in September 2016 and we then embarked on a painful year of deep grief for Matilda. We did get a puppy, not as a replacement for our child, but a focus for all the love and care we had to give. He kept us going through some difficult times and everyone, including Matilda’s grandparents, fell in love with him. In August last year, after two unsuccessful rounds of IVF in the UK, we went to Prague for more treatment. Unfortunately the first round there didn’t work but we felt peaceful, we tried to appreciate what we had. In October it was Tom’s 40th and, amid all the celebrations, I went to Prague with my Mum to have another embryo implanted which turned out to be Raphael. St Thomas’ clinic cared for us amazingly well. We saw Professor Shennan early on in the pregnancy, then, after 12 weeks, could go in as often as we liked which was so reassuring. Everything went smoothly until my waters broke at almost 32 weeks. I was scared, but the team reassured me, and two days later Professor Shennan delivered Raphael by C-section, he was perfect. But, just an hour after he was born, Tom came to me, in tears, to tell me our baby was really sick. I didn’t believe him at first but Raphael was fighting for his life due to the infection he’d contracted as I gave birth. It was the most hideous two days, we really feared we’d be saying goodbye to another child. In NICU we relived the nightmare, barely able to function, then, on Sunday, he turned a corner as his blood pressure settled down. He was in intensive care for two weeks but he fought and fought. We suffered a further blow when they thought he had a congenital liver condition, fortunately he doesn’t but it was another hurdle. Then, six weeks after he was born, we brought him home and we couldn’t really believe it, a lot of the time we still can’t. I look at him and think ‘I can’t believe you’re ours and we get to keep you.’ We feel so lucky. We couldn’t have asked for more from Tommy’s, they looked after me, Tom and Raphael and we really believe we had the best care in the world. The team are so humble, they look like normal people but they are really miraculous human beings and we don’t know how to show our gratitude. Giveacar is the UK’s first car donation scheme, we have won several awards and now support over 1,600 charities with the money raised from old cars. Using a nationwide network of breakers yards and salvage partners, we have handled the auction and disposal of over 35,000 vehicles so we know how to raise the best donation possible whether your car is in perfect condition or not. Tommy’s are working hard to fund research to help save babies lives. If you need to get rid of an old car and would like to do some good at the same time, give us a call 0207 736 4242!